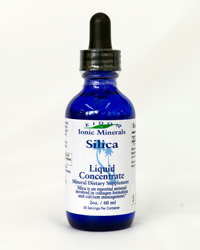 Of all the minerals important for good health, silica is by far the most underrated and misunderstood mineral of all. It is the seventh most prevalent element in human tissue after calcium. Research done in the 1970's by Dr. Edith Carlisle at the UCLA School of Public Health affirmed without any doubt the extreme importance of silica. Her research, performed at the UCLA School of Public Health, showed silica to be essential in collagen formation and connective tissue strength. Collagen is the tough fibrous material which holds us together and is the major component of everything from our bones to our skin. Supplementation with this essential element may improve or alleviate many of the following diverse symptoms: Calcium deposits on bone, in joints, and in soft tissues (calcium mismanagement). Teeth and gum disease, and structural failure. Gastrointestinal problems such as acid indigestion, acid reflux, and Crohn's disease. Arthritis symptoms primarily associated with osteoarthritis. Osteoporosis - silica helps the body deposit calcium into bone rather than into areas it shouldn't be. More importantly, silica helps maintain proper bone collagen levels; giving bones greater flexibility. Arteriosclerosis - studies have shown that hardened arteries are high in calcium and low in silica. Healthy, flexible arteries are high in silica and low in calcium. Skin, hair and nail disorders. Vertigo This is a diverse list, yet there is a common thread running through them all: proper collagen production. Eidon manufactures and distributes the finest liquid silica available anywhere.